Chiropractor East Liverpool OH | Miladin Chiropractic Inc.
Feel Great at Miladin Chiropractic Inc.
East Liverpool Chiropractor Dr. Craig Miladin offers his patients customized care options in pain relief, athletic excellence and wellness optimization, with particular emphasis on the unique needs of moms-to-be. At Miladin Chiropractic Inc., our practice also enjoys working with high school and professional athletes, and those that want to get the most out of their golden years. Over two decades of experience have provided us with the research-based tools and expertise to be of service to the members of our community, without regard to age or current state of vitality with chiropractic care. We have a reputation in the community for technologically-advanced adjustment delivered with a precise and gentle touch. Dr. Craig almost exclusively uses a hand-held instrument that contains sensitive sensors that prove immediate feedback to the micro-computer built into the device: The iQ Adjusting Instrument®. What does this mean for you? An accurate adjustment that provides immediate feedback for fast, effective relief. We pride ourselves on being a referral-based practice. Our office receives accolades for our comfortable care, and we appreciate that most of our patients find us through word-of-mouth. Prenatal chiropractic care is one of our specialties. Dr. Craig is a certified Webster practitioner, which affords his pregnant patients the opportunity to experience a safe, comfortable and optimal pregnancy. Studies have indicated that those women under Webster care undergo shorter delivery times with less chance of complications. The pregnancy itself is often more enjoyable as well, with a great decrease in unpleasant symptoms. The techniques we offer require no twisting, popping or cracking of the neck or back. We use technologically advanced instrumentation as our primary method of adjusting, and patients love it! We offer the required physical examinations to children getting ready to be involved in sports or preparing to head off to camp. Your child does not have to be a patient of our clinic to be eligible for this service. Our average wait time to receive an adjustment is less than five minutes. And, if you’re one of our established patients and find yourself in a pickle where you can’t get into the office, Dr. Craig will come to the rescue. He does make house calls to be of assistance where he can. We’re effective, affordable, transparent and personalized. We’ll always treat you like family, as we’re just everyday people ourselves just wanting to help others. Read some of our patient testimonials here. The experienced and loving care at our beautiful location is compassionate, supportive and heart-centered. We want to earn your trust and partner with you in improving your health. Contact us today for a same-day appointment with our Chiropractor East Liverpool Dr. Craig! We also feature Saturday appointments and walk-ins are always welcome. The office personnel was very nice, the doctor was awesome after seeing 3 doctors the fixed me right up. My daughter is 2 years old and has been seeing Dr. Miladin for about 8 months. She loves to go to her appointments and she has not had an ear infection since she began her visits! We were looking for an affordable alternative to ear tubes and I think we found it! I love the affordability of the care, the friendliness of the staff and the quality of care my daughter has received at Miladin Chiropractic. 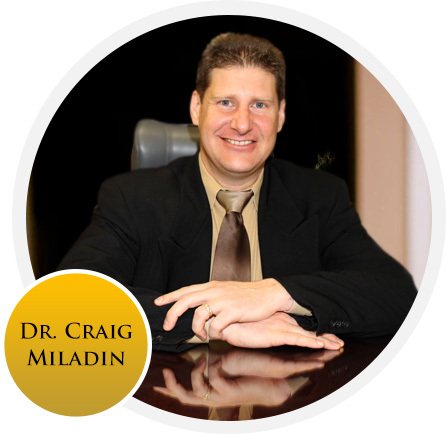 I would recommend Dr. Miladin to anyone and everyone! Our family loves Miladin Chiropractic. Great visit always feel better after. Kindness of the Dr is appreciated and his care and concern are genuine. Dr. Craig is just very accurate in doing his adjustments and checking you from head to toe. I was a lot of pain when I got to his office and one day later I am feeling much better with very little pain. I would recommend him to anyone. I drove an hour and a half to get an adjustment from him and as they always say…the difference is worth the distance. Quick service with little wait. Informative and very pleasant doctor who knows each patient by name, immediate relief from pain. As always my experience at Miladin chiropractic was even more than expected. It’s good to know you are in good hands with Dr. Craig and his staff of people who really care. My experience was very good. Dr. Miladin was very friendly and thorough. He explained everything he was doing before and during each treatment. Wonderful to have a Dr. who will see you as a walk-in. Great service, great people. Dr. Miladin saved my gymnastics career! How can we help you? Call Today! 48892 Calcutta Smith Ferry Rd.